If all goes according to plan, Jon and I will be out of Oklahoma within the next few weeks. Kind of crazy, right? It's been a little hectic knowing that everything is coming down to the wire, but we're hoping to know something solid by the end of the week. And because our stuff will be packed up and moved into storage by movers, I'm not as stressed as I would be if we had to do all of the moving/packing ourselves. Even though we're not packing up our own things, I've still been trying to go through each room of the house and figure out what we can get rid of. There's no sense in storing and moving things that I will ultimately want to give away once we get into our new place anyway. But then the question arises "What should we do with the stuff we no longer need?" Jon and I usually just donate our unwanted items to the local donation center. I'd say we've given away about 15 bags of donations and hundreds of dollars of furniture since we've been married. At the time, it was the easiest and fastest way to get our house together. But now that we're just trimming down for sanity's sake, I really want to try to make a little dough on the items I'm wanting to purge. After all, because we've already given away so much, the items that remain are all good, useable items that are fine for someone else, just not being used by us. All that being said, I think it's time to have our very first yard sale! I'm not going to lie; the whole idea is a bit intimidating to me. But I think it will be worth it in the end, so I'm all aboard. Jon took a little convincing at first, but in the end, he warmed up to the idea. 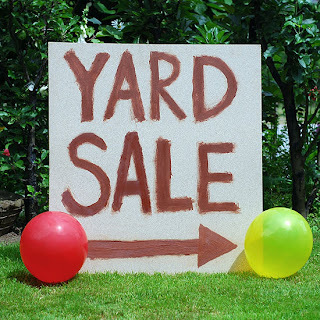 -Purchase a yard sale permit from the local police department. Luckily a friend told me about this. I definitely would have been a law breaker had they not. -Price items. I hear this is a must for a smooth yard sale. People don't want to constantly have to ask the price of items. Nor do you want to have to always be telling them. -Advertise event via facebook, craigslist, etc. 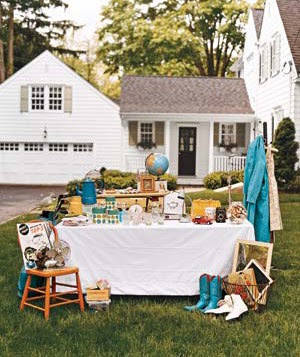 Better Homes and Gardens magazine recently featured an article on how to have the best yard sale as well. Here is a link to that. Alright, it's time for me to get back to the purging. I've already gotten rid of 30 clothing items, 4 purses, 4 pairs of shoes, a whole bag of jewelry, 5 frames, 2 photo albums, 13 movies, and 20 books. That, my friends, is what you call an accomplishment! I'll be sure to let you know how it all goes! In the meantime, PLEASE let me know if you have any tips of your own. I am a complete newbie at this, so all suggestions are greatly appreciated!